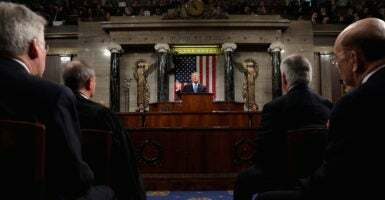 President Donald Trump broke nearly all records for a modern State of the Union address, generating 115 rounds of applause as he addressed the nation for his first official review of his presidency, according to a Daily Caller News Foundation review. Former President Barack Obama was interrupted 90 times and former President George W. Bush generated 80 applauses during their addresses to the nation, according to State of the Union applause reviews by New York Magazine and CNN. Former President Bill Clinton holds the State of the Union applause record. He produced 128 applause interruptions in his 2000 State of the Union speech. Trump introduced military and police heroes, two families devastated by the murder of their daughters by illegal immigrants in MS-13, and a North Korean who escaped the totalitarian nation. Near the end of his unifying speech, Trump was even able to generate “USA” chants. Applause at the State of the Union is not the total measure of a successful address to the nation. But it can indicate the strength and popularity of a president’s message to the nation as well as his ability to reach out to the opposing party.